I'm writing this blog hot on the heels of having watched the new Doctor Who opener The Eleventh Hour. I had faith that Stephen Moffat would look after the series, even when my initial reaction to Matt Smith's inheritance of the role first became known was a little queasy... and when the naysayers and doubters came out in force. I didn't understand how it could work... but if you are a long time fan of the Doctor, you learn to look beyond these things and trust that things will work out. 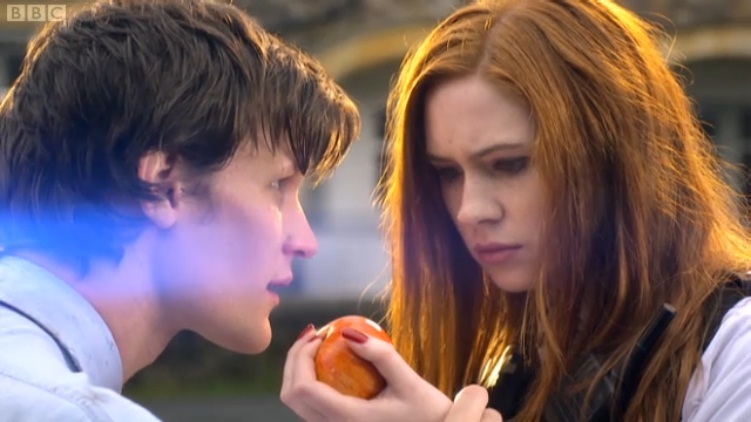 The Eleventh Hour was brilliant. I think it was paced really wisely. The script gave breathing room for Smith to work into the role by injecting regular bouts of humour. In truth one of the things that makes Doctor Who magical anyway is its ability to offset dark plots with excellent humour and multifaceted characters... that and of course it's unique in built regeneration plot device that helps keep the show eternally evergreen. There were plenty of memorable quotes, especially the line about having nothing to fix the universe with except a post office which was closed... and the Doctor admitting he was a mad man with a box (but that this was a truth that one day your life might depend on). Mothers across the country may very well be terrified at the prospect that their children will even as I type, be emptying the pantry of custard powder, the freezers of fish fingers... and emulating the Doctor's new culinary invention - fish finger custard. Some people have been a bit critical of Karen Gillan... but I don't see why, she did pretty well. Maybe those critics are just paranoid racists and think that she's going to to turn out like Bonnie Langford just because of the hair. Bonnie Langford was just "naturally" annoying in Doctor Who... it had nothing to do with her hair. I liked her (No not Bonnie, I mean Karen!!!!! Phew I think I got away with that). I found it quite appropriate that the episode fell on Easter Saturday. 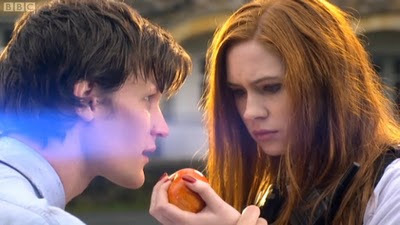 The Doctor promised his companion (then, companion to be), that he would return. However he then disappeared and she was left to wonder if she'd gone crazy and had an imaginary friend throughout her childhood... felt let down. Similarly, it's no secret that Jesus had told his followers on several occasions that he was going to return... but future promises are often a cold comfort in the face of disappointment (in Amy's case), or desperate grief (in the case of the apostles). As human beings we experience things emotionally and deal with things in the here and now. We are linear creatures and struggle to see the big picture. Stephen Moffat described Amy Pond as being the kind of person who had become bitter and cynical about things like Santa Claus and the Tooth Fairy at an early age because of the Doctor's failure to return when she expected. I liked the way that the Doctor returned to a cynical, hard hearted Amy Pond years down the line and convinced her to trust him. Ultimately he understood that the inner child that craved adventure and yearned to believe, still existed deep within; I think it was to this that he was appealing to. Certainly at the end when he invited her to join him, he pretty much explicitly states this. When Jesus returned to life (and importantly he wasn't late in keeping his appointment), his disciples probably had the same issue. They had to choose between trusting their cynicism, fear and depression... or open themselves up to the possibility that the wonderful but unimaginable was true... and the latter is something our inner child is equipped to do. This is something that interests me generally, but also particularly at the moment because I see many people I have grown up with filled with bitterness and cynicism to matters of faith. They unconsciously do this because of how God, Jesus and the whole topic of faith and spirituality was presented to them in their youth. Life and love were exorcised from faith and the truth was substituted cold religion... and that was something that they had no love for. I wonder what would happen if they realised that the risen Jesus is not like the Tooth Fairy at all, is VERY real... and that he's there appealing past their hard heartedness and towards their inner child (not their naivety... it is possible to be childlike without being naive). Upon his return, the Doctor asked Amy to trust him for just 20 minutes. It was only after that time was up that she finally understood that he was that person who she initially trusted and laid her hopes upon as a child. Maybe that's where my friends need to be. Maybe that's where you need to be. Perhaps you aren't ready to trust God on a journey of a lifetime just yet. However... maybe, just maybe you need to give Jesus 20 minutes... or however long is relevant in your circumstances. Give him that chance to reaffirm with you that he is not an imaginary friend and not a tooth fairy; nor the taskmaster who demands robotic followers... but a real person, the fantastic one who can be relied upon in life. Maybe this is your time to get reacquainted. I didn't make a direct comparison... that would be foolish. I just draw parallels... it's what I do (Paul used to do the same thing). I have a gift for being able to see allegory, analogy and parable in things. Take a look at my Doctor Who tag and you'll see a few others. Same with various other film/TV/comic series and characters. He is risen indeed... Alleluia!